Before I embroidered my first sweet bag, I recreated a pin cushion to learn about the process. Unfortunately, I have misplaced my pin cushion and all the associated photos. When I find the pin cushion, I will re-photograph and re-post. Meanwhile, the surviving text is below. Scanned hardcopy page from my original Persona Pentathlon entry, 2007. I chose to recreate Victoria & Albert Museum item # T.52&A-1954. It is part of a matching sweet bag and matching pin cushion set. I enlarged the photo as much as possible without losing the detail. Then traced the image on a light box to enhance the detail. For example, the bird detail in the upper-left corner is almost obscured. Using the light box to develop a tracing, and then working from the tracing allowed me to create a sweet bag with crisp detail. After I made the first rendering, I had to examine it to determine what was wrong. The flowers looked warped. Why? The item is a curved surface. It is most likely stuffed with wool. Also, the item is mostly organic and 400 years old. The embroidery we’re looking at the executed pattern, not the drawing underneath…which was probably much more crisp. 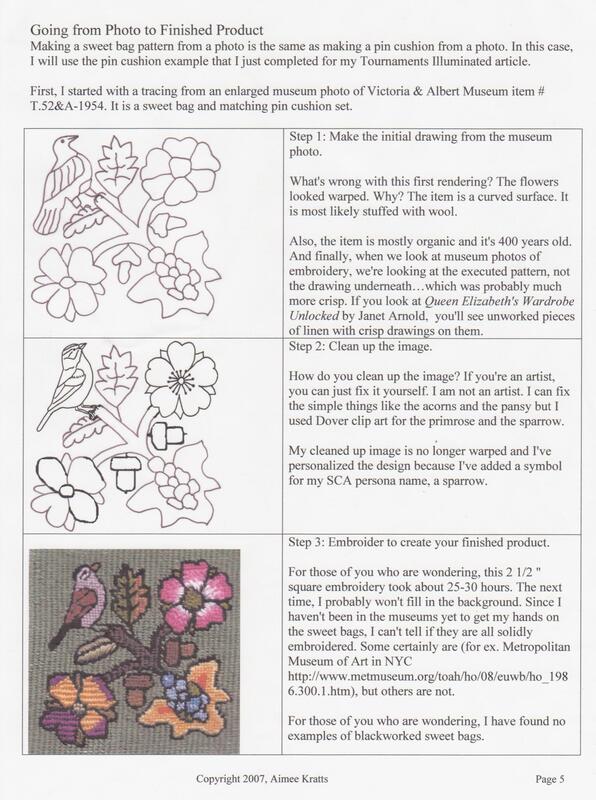 If you look at Queen Elizabeth’s Wardrobe Unlocked by Janet Arnold, you’ll see unworked pieces of linen with crisp drawings on them. Since the first image is somewhat distorted, I refined the lines for more clarity. The clarified image is no longer warped and I’ve personalized the design by adding a symbol from my SCA persona name, a sparrow. The last step is embroidery, a time-consuming part of the project. This 2 1/2 ” square embroidery took about 25-30 hours. It would have proceeded more quickly if I had used silk thread and magnification, which would have helped considering that I was working on 1-over-1 embroidery. This recreation also took longer because I used cotton threads, which tangle.A note about the background…I made this pin cushion before I understood that the silver-ish background on the pin cushion was metallic silver thread. I thought that either the background fabric was un-embroidered gray or the background threads were gray. This is a good example of why it’s really important to do good research before you make your object. In this case, I have a lovely pin cushion with a background of gray-green DMC thread, when in fact I should have embroidered it with silver thread. It photographs very closely to the original, but in person, it looks completely different.